Empire: Inevitably, Fail-Safe rings less true than Strangelove by insisting on a dignified, humane, liberal response to a situation that more aptly produces horror, hysteria and biting misanthropy, but Sidney Lumet has a knack of wringing suspense from scenes in which men in suits or uniforms sit or stand around indoors exchanging pointed dialogue. Fonda is the ideal image of what a US President should be like, and a large supporting cast includes pointed turns from Walter Matthau as a Strangelovian doomsday theorist ('these are not normal people, these are Marxist fanatics') and future funnyman Dom DeLuise as the technician heartbroken at being ordered to share vital information with the Soviets. The (understandable) withholding of US defence department co-operation means that minimal amounts of stock-footage had to be processed, used in repeated shots or even negative, to convey the far-off front line where the war is close to breaking out. It’s technically very innovative: General Dan O'Herlihy's Sarah Connor-like holocaust dreams and the minimalist destructions of major cities (unforgettably conveyed by the whine heard on the hot line when the telephone at the other end disintegrates) seem the sort of bold strokes you’d expect from a contemporary cutting edge director rather than a major 1960s motion picture. Due to my interests in Cold War history, I have always wanted to see this movie. Is it currently streaming somewhere? We watched this in 11th grade AP US History. I thought it was pretty good at the time. I was a cold war kid, and for some reason my 5th grade social studies teacher read this book to us, little by little, in class. this would have been 1975. I remember being so chilled by it that I couldn't wait once I heard there was a movie version. One of our local tv stations (you know, one of 3 in those days) played "classic" movies on saturday night, and would list them in the TV guide. Every week I'd look in hopes of seeing it listed until finally, who knows how many weeks or years later, there it was: Fail-Safe with Henry Fonda. I ate it up and only saw Dr S many years later and thought how familiar and yet so different it seemed. I've loved Strangelove since I was a kid (probably saw it too early), but I've only seen this in the past few years. I like it a lot. The shared source material is obvious, but they are such different movies, each with different but still iconic endings! I really love Lumet's earnestness in general, and particularly how well it works with Fonda here. Gotta love your young Larry Hagman, and Sorrell "Boss Hogg" Booke is also in the scene when the group is touring the war room. I've never been sure which order a "fail safe"/"strangelove" double-header should be shown in. The film doesn't really get going until the scenes with Fonda and Hagman. A lot of the military procedural stuff was probably very "real" feeling in 1964, with the Cuban Missile Crisis not that long ago, but even when I first saw this movie in the 1980s it felt dated and cliche. But that moment when the bomb hit Moscow and Fonda listens to the whine of the ambassador's melting phone and realizes what has happened and is about to happen is so intense. 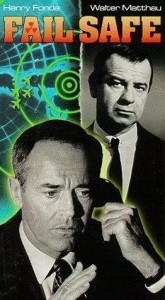 There was a passable live television version of Fail-Safe a number of years ago produced by George Clooney, with Richard Dreyfuss and Noah Wylie in the roles of the President and Buck (Clooney himself played the pilot of the bomber that gets to Moscow). Having seen them as a double-feature a couple of times, I much prefer to see Fail-Safe first, then Dr. Strangelove, mostly to break the tension. Poor Fail-Safe indeed - it wasn't a flop because it was necessarily bad, rather as it was heading up the steps to debut, it was shoved back and forced to debut after a fantastic dark comedy on the same topic. Who wants to be the serious lecturer to follow a great comedian? Oh God. Saw this movie at 13 while babysitting. Not age appropriate. The final choice, which seems so unimaginably contrived now, gutted me at the time.